​ We are excited to offer this showy, silky, fancy girl from our very best genetics. She is by our best producing sire, Argentine Cerrado, and out of our best dam line. She is her dam Adelaide's first cria, and her dam is one of 9 females produced by our herd matriarch, Ayni. Ayni will be 17 this summer as she delivers her 11th baby and she is still in excellent shape. 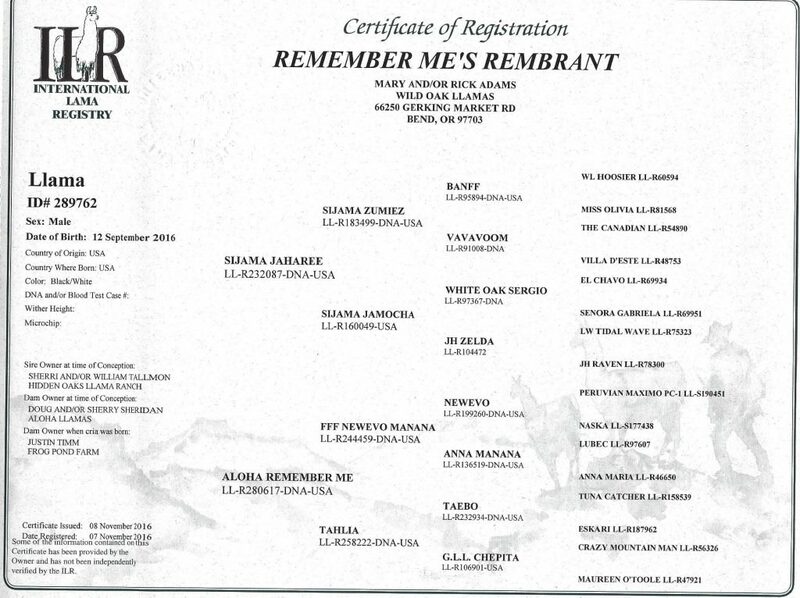 Almeda's pedigree includes: Arg Valentin, Arg Fresco, Na Pali, Federale, and El Fuerte. We think she's the perfect mix of flashy Argentine genetics and tried and true Peruvians. ​This young show and stud prospect offers excellent confirmation, fine and dense fiber, great bloodlines, and unlimited potential. His sire is out excellent producing Full Argentine stud - Argentine Lumberjack. His dam is a great Mark Smith Farms female sired by GNLC Full Tilt. Don't miss this opportunity. This beautiful 1/2 Argentine female is truly living up to her name" Love. " She has been a delight to have in our herd. With her ever up attitude and gentle nature, she is the best. With our female herd growing we can't possibly use them all. These great Argentine genetics need to be passed on. She has been exposed to Mckenzie Lake Quasar for her first cria due in April 2020. A good Possibility for appy spots. 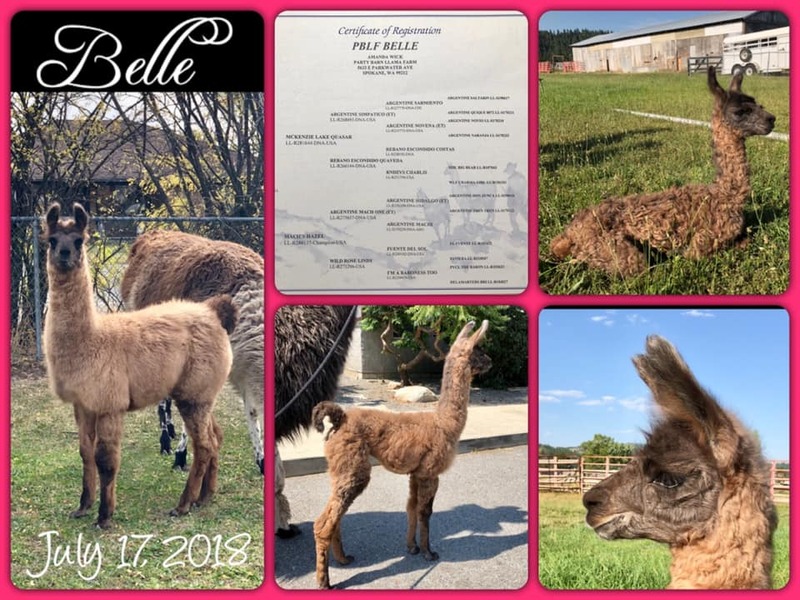 ​PARTY BARN LLAMA FARM SPOKANE, WA 509-863-8443 PARTYBARNLLAMAFARM@GMAIL.COM If you want dense fleece with superior conformation and an amazing pedigree, then Belle is for you! Her sire is the Exotic Grand Champion and Best in Show winner McKenzie Lake Quasar and her dam is the ILR-SD Champion Mach's Hazel! Her pedigree also includes Argentine Simpatico, Argentine Mach One, Argentine Hildago, Rebano Escondido lines, and El Fuente from Hinterland fame! Don't let this amazing female slip away, add her to your show string and later your breeding program. 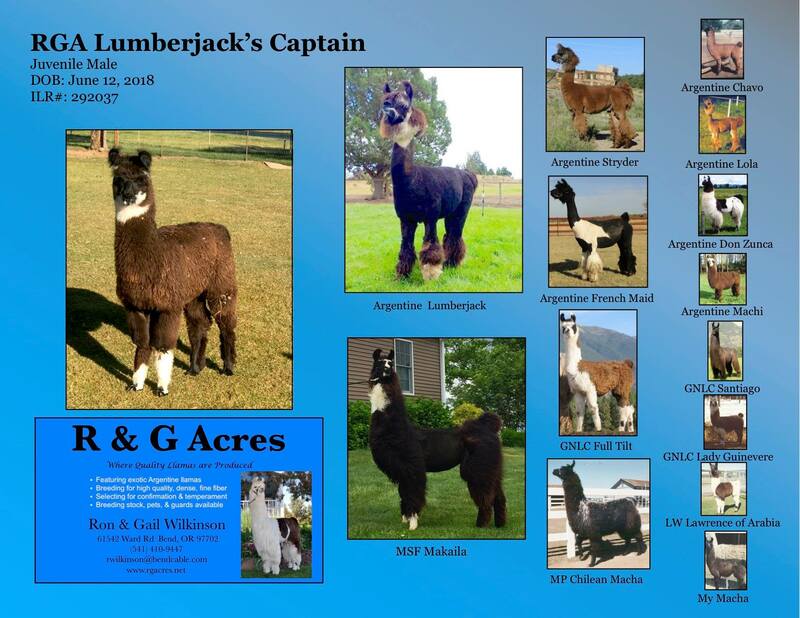 When we first laid eyes on this handsome boy, he was a cria at side of Aloha Remember Me at Justin Timm’s sale held at Frog Pond. We just had to own him. He has grown into a substantial young male who is easy to halter and handle. “Remy” has a remarkable temperament. With The Canadian on the top and Tuna Catcher on the bottom, he has impressive and powerful bloodlines to add to anyone breeding program. He is 43 inches at the withers and 70” at the pole. If we didn’t have so many outstanding young males, we certainly wouldn’t let him go. Rembrant is one of our best young males and we are proud to offer him for your consideration. Amazing brown suri male with great stretch! As a grandson of both LAMS Nutcracker and GNLC Merlin, it would be hard to find a better pedigree! He carries Great Northern Lines on both sides of his pedigree. 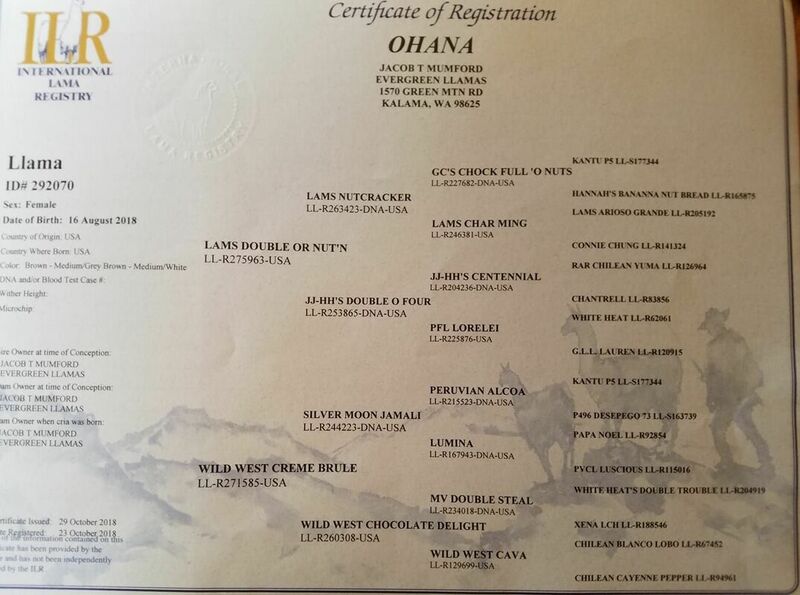 Ohana means family and Ohana the llama has been a favorite of my family since the day she was born! She has amazing presence and out of this world silky/suri fiber. 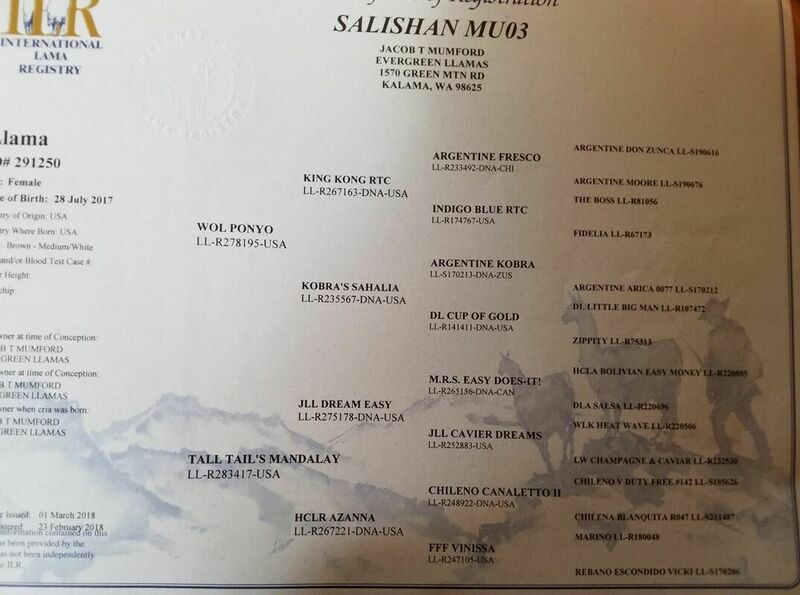 Her pedigree includes Nutcracker, Silver Moon Jamali, Kantu, White Heat, Crazy Mountain Man, and more! Buy her - Love her - Show her! You saw her daughter sell as lot # 29, now here is your chance to buy the factory! Sometimes these good producing brood females are the best buys of a sale, the guess work is done, all you have to do is raise you hand! 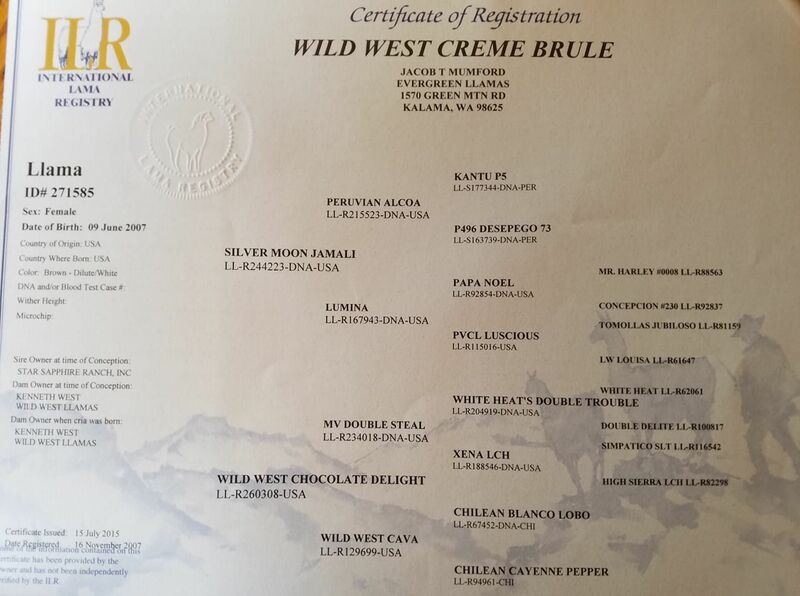 Creme Brule is a nice sized girl with substance and silky golden fleece. She milks like a Holstein, and has had 3 beautiful babies for us and 2 for Nofzigers. She is bred to Rastaputin (ET), our Exotic grey male that gets a lot of attention and is putting some amazing cria on the ground (check out Amanda Wick's Rata baby "Nala", who sells in this sale as lot #18). We think This could be Creme's best baby yet! 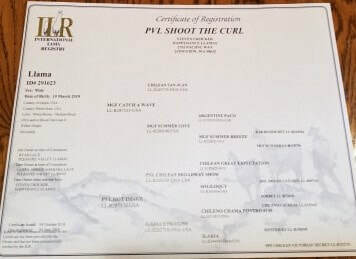 Shoot the Curl’s first time off the farm was the Longview Christmas Parade, Cascade Show and Sale will be his 2nd time off the farm. He is a friendly and curious boy! He has beautiful color and fiber, as well as correct confirmation. He also brings you pedigree power with unique genes not commonly found in the West. Names like Chilean San Juan, RAR Ricochet, Chilean Broadway Show, Chilean Great Expectation, Dream Catcher and others are all in his pedigree! His mom came from the great PVL herd in WI and his dad was born and bred at McRobert’s Game Farm in Nebraska. A consignment of Steve Crocker and Bonnie Doble of Longview Washington. ​Blackcloud is nearly a photocopy of his sire: Argentine Mach One. His dam comes from Chilean lines from Kay Sharpnack's program and suri lines going back to Kantu. He is very straight, his fiber is wonderful with fantastic distribution and his personality is a winner too! 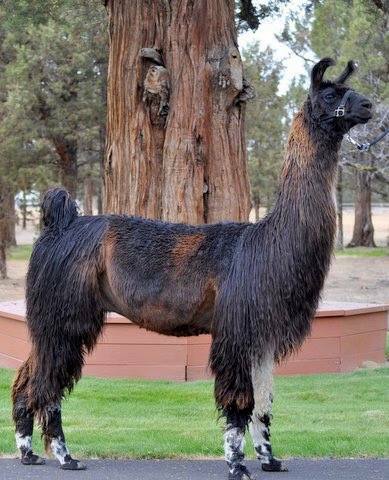 There is huge potential in this true gentleman of a llama! ​ LOVE this female! Very sweet and correct with great fiber too! Great pedigree includes King Kong RTC, Kobra, Don Zunca, MRS Easy Does It!, Chilean Canaletto, and many more! Her mom and dad were both ALSA and ILR-SD winners. Be sure to look at her younger photos when she was in full fleece.